The Friends Models "Dinky" at Charlie Purinton's home track in Byfield, Mass. in the 1970s. Photo from the collection of Carl Purinton, courtesy of CAP Purinton. Bob Hagopian with his Friends Models "DINKY" at the New Jersey Live Steamers in 1982. 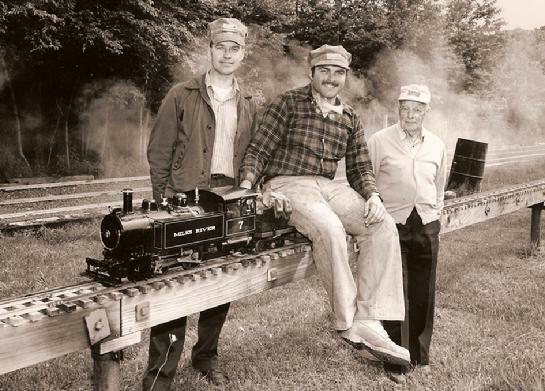 Bob Hornsby is at left, and Mr. Purinton (Carl), at right. The 1" scale narrow gauge "Dinky" for 3-1/2" gauge track. Designed by Karl Friedrich, it was available from Yankee Shop decades ago. Now available again. Coal fired; Walschaert valve gear; link and pin couplers. Hand pump; axle pump. Left or right injectors may be fitted by the builder. This is an excellent engine to learn on. Coal fired; clear and simple prints; will pull 2 adults. May be finished with side tanks as designed, or with a tender of your own design if you so choose. Steams well; light enough to be carried by 1 person; easy to take to other tracks. PROTOTYPE: This design is based on industrial locomotives as built by H.K. 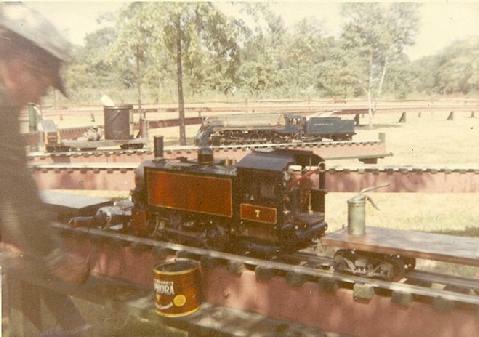 Porter Co. and "UPSY" represents a medium-sized 0-4-0 Side Tanker. These dinkys were built in almost infinite variety and when you consider the different styles and gauges involved there must have been at least 300 different kinds of 4 wheelers built by H.K. 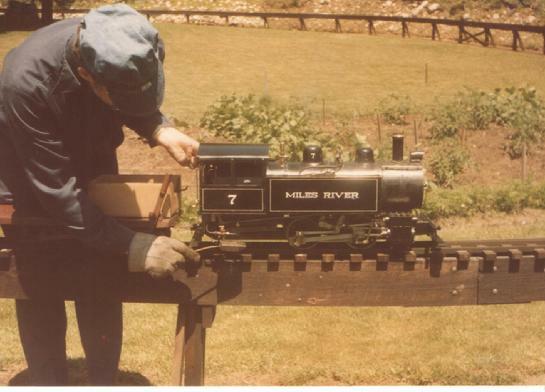 Porter in the days before diesels. This particular design carried its coal under the fireman's set box in the cab, hence no coal bunker is visible. They were also made with a little 4 wheel fuel car. Side tankers and saddle tankers were built from the same patterns, size for size. The sizes ranged from 9" x 14" cylinder and 28" wheels to 18" x 24" cylinders with 46" wheel. All but the smaller sizes were available with either piston or slide valves, and Walschaert or Stevenson valve gear. Only the larger sizes had fluted rods. This design could also be the basis for a 1-1/2" scale locomotive, in which case it would represent a prototype with 10" x 14" cylinders and 30" wheels, 4'-3" wheelbase. PERFORMANCE: During the 1952 Brotherhood meeting at Danvers, Mass. "UPSY" made several non stop runs around the big loop which is 1800 feet long and includes a 2.5% grade. HAND PUMP: There is plenty of room in the left side tank for the "Yankee Shop" standard hand pump. SIDE TANKS: Hold enough water for running on a short up and down track or a small loop. If longer runs are desired a special riding car can be constructed which will hold a couple of gallons of water and also some extra coal. Drawings and castings now available! Look the project over with these 9 sheets of well-drawn, easily understood prints from Mr. Friedrich's originals. They were drawn between 1949 and 1952. Click the Paypal button below, to purchase the drawings with Paypal or your credit card. Cost is $95 plus $20 shipping to the USA. For other countries, please inquire. Castings also available below. Thank you for your interest. The frame is made of 2 pieces of hot-rolled steel, each one being 3/8" thick x 2" wide x about 26" long. The 3/8" x 2" size can be purchased in a 48" length at your local hardware store, "Big Box" home improvement store, or your local or online metal supplier. Section 1 of the castings is the axle pump block, and 2 eccentrics, in bronze. The pump block is solid and not only serves as a pump, but also as a frame brace. Made in New England, USA. Cost for Section 1 is $125 plus shipping. To purchase, click the Paypal button below. For other countries, or to pay by check, please inquire. Section 1 for "DINKY" is the axle pump and its eccentrics. To purchase, click the Paypal button at right. For countries outside the USA, please inquire. Section 2 of the castings includes the cylinders and the steam chests (in iron), and the steam chest covers in bronze. Made in New England, USA. Cost for Section 2 is $245 plus shipping. To purchase, click the Paypal button below. For other countries, or to pay by check, please inquire. 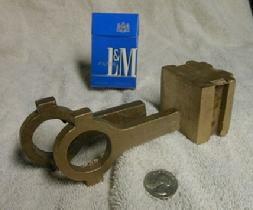 The 1" scale narrow gauge (for 3-1/2" gauge track) "DINKY SHIFTER" cylinder set. Cylinders are the standard "Yankee Shop" slide valve cylinders in iron, with iron steam chests and bronze covers. "D" valve is bronze, fabricated by the builder. This forms "Section 2" for "Dinky". Click the Paypal Button on the right, for your DINKY cylinder set to be shipped to the USA. Please click the Paypal button at left, for your DINKY cylinder set to be shipped to Canada. 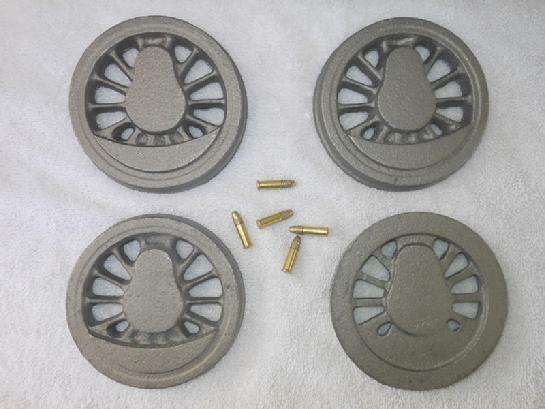 Set of 4 wheels, cast iron, made in USA. 3-3/4" wheel tread diameter. Cost $160 plus shipping. For other countries, please inquire. Drive Wheels for the 1" scale narrow gauge "Dinky". Wheel tread is 3-3/4" diameter. Cast iron, made in USA. Firearm cartridges at center are .22 caliber "long rifle", shown for size reference, and are not included! Click the Paypal link at right for your DINKY wheels to be shipped to Canada. 1" scale, 3-1/2" gauge "DINKY SHIFTER". Designed by Karl Friedrich. This example circa early 1960s at New Jersey; photo by Keith Taylor.